1887 For a record price of $10,000, the Cubs, then known as the White Stockings, sell current National League batting champ and future Hall of Famer Mike King Kelly to the Beaneaters. The popular box office draw, who will earn his nickname King while playing in Boston, will continue to be productive, hitting .311 for three years during his first tenure with the team. 1928 The American Legion baseball program, on the brink of bankruptcy, receives a pledge of $50,000 from Commissioner Kenesaw Mountain Landis and the MLB Advisory Council to continue its development of a national championship program for teenagers. With the much-needed funding, Legion Baseball will continue in 1928, and the following season, teams from every state and the District of Columbia will participate in the youth tournament. 1934 Sam Rice, who spent the first 19 seasons with the Senators, ends his career after playing one year with the Indians. The 44 year-old future Hall of Famer collected 2,987 career hits during his two decades in the major leagues. 1945 Braves president Bob Quinn retires, with his son, John, becoming the team's general manager of the team following his father's departure. The former owner of the Red Sox and Braves, whose grandson will also become a major league GM, will serve as president of the Baseball Hall of Fame from 1948 to 1951, resigning from the position after suffering two strokes. "Anything that tends to break down the bulwarks of segregation must be forcibly met by this general assembly. We have a situation in Georgia which has come about because of a national situation. I am referring to the Negroes in organized baseball in this state. It is unfortunate that some few people would participate in the destruction of our institutions for a few dollars." - GEORGIA STATE SENATOR LEON BUTTS, commenting on his bill that prohibits blacks from playing baseball with whites. Ten years after the integration of major league baseball, the Georgia Senate unanimously approves Leon Butts' bill barring that prohibits blacks from playing baseball with whites except at religious gatherings. The Lumpkin legislator's measures, which carries fines up to a $1000 and imprisonment for 60 days to a year for committing the misdemeanor, will directly impact the minor league spring training centers of the Braves and Cardinals, whose farmhands workout, respectively, in Waycross and Albany. 1959 The Orioles, to find a backup for first baseman Bob Boyd, buy 32 year-old veteran infielder/outfielder Whitey Lockman from the Giants for an undisclosed sum. In June, Baltimore will trade their new acquisition to the Reds for Walt Dropo, who has played the position exclusively since winning the Rookie of the Year award in 1950. 1996 Kevin McClatchy and his group of investors purchase the Pirates from the Pittsburgh Associates. The deal includes the condition of having to build a baseball-only ballpark in Pittsburgh within five years. 2001 The Ford C. Frick Award, named in memory of the former baseball commissioner who was a broadcaster, will be given to the Marlins' radio announcer Rafael Ramirez during Hall of Fame induction ceremonies this summer. 'Felo,' who began his 56-year career broadcasting games in Cuba, has been in the Miami broadcast booth since the team's inaugural season in 1993. 2001 According to the Detroit Free Press, major league baseball is informing umpires to remove pitchers without issuing a warning who deliberately throw a beanball at a batter's head from the game. The crackdown, according to officials, is a clarification and reinforcement of an existing rule. 2002 The Tigers sign Dmitri Young (.302, 21, 69) to a four-year contract with two team options. The Tigers traded outfielder Juan Encarnacion (.242, 12, 52) and minor league right-hander Luis Pineda in December to acquire the first baseman/outfielder from the Reds. 2003 After much speculation with the help of Major League Baseball, the Chunichi Dragons return Kevin Millar to the Marlins for an undisclosed amount of money for relinquishing their rights to the outfielder. After reconsidering an offer from the Red Sox, who blocked the waiver deal to obtain him, the 31 year-old California native had a change of heart and didn't want to play for the Japanese Central League team. 2005 The Twins sign Johan Santana (20-6, 2.61), who was eligible for arbitration, to a four-year deal. Last season, the 25 year-old southpaw became the first Venezuelan to win the Cy Young Award. 2007 For the first time at Wrigley Field, the Cubs will allow ads on the green doors located in the ivy in the left- and right-field bleachers, according to Jay Blunk, director of marketing and sales. 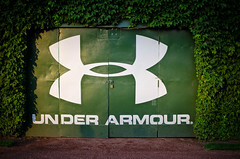 Although other companies have approached the team, Under Armour, whose company spokesman is newly acquired outfielder Alfonso Soriano, is the "right fit" for the 7-by-12 foot signage featuring the performance apparel's signature logo. 2009 The Angels and Bobby Abreu (.296, 20, 100) agree to a $5 million, one-year deal. The 34 year-old free-agent outfielder, taking a significant pay cut after having a solid season with the Yankees last season, is expected to add some much-needed punch from the left side for the AL West champions. 2011 The Yankees come to terms with free-agent Andruw Jones on a $1.5 million, one-year contract, eliminating the likelihood of the team resigning Johnny Damon. The 'Curacao Kid,' best known for his outstanding outfield defense for the Braves at the start of his career, will spend two seasons in the Bronx, before finishing his 17-year major league tenure with a lifetime .254 batting average. 2011 Avoiding arbitration, Carlos Marmol agrees to a three-year, $20 million deal with the Cubs. The 28 year-old closer saved 38 games in 43 opportunities last season along with compiling a 2-3 record and an ERA of 2.55. 2014 Avoiding arbitration, 24 year-old outfielder Jason Heyward and the Braves agree to a two-year, $13.3 million deal. After the season, Atlanta will trade their 2007 first-round pick (14th overall) along with right-handed reliever Jordan Walden to the Cardinals for right-handers Tyrell Jenkins and Shelby Miller. 2014 Freddie Freeman agrees to a franchise-record eight-year, $135 million contract, surpassing the six-year, $90 million deal the Braves gave Chipper Jones in 2000. The 24 year-old All-Star first baseman, who finished fifth in the MVP balloting this season, has hit .285 during his four years with the team, annually averaging 17 home runs and 70 RBIs.